What can I say? I just love books. Indie/self/trad published…I don't give two monkeys. My reviews are always my subjective and honest opinion. Nothing more and nothing less. 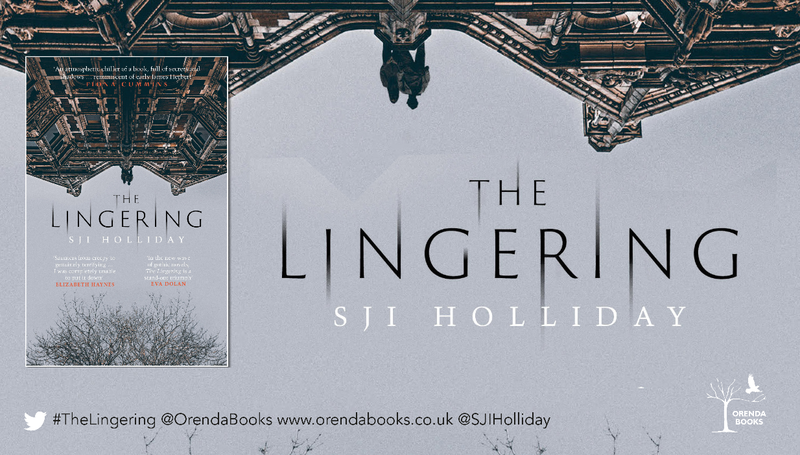 Today it’s my pleasure to take part in the BlogTour The Lingering by S.J.I. Holliday. It has a gothic vibe, and yet simultaneously it has the feel of pulsing modern crime story, both elements feed on each other to create a captivating read. S.J.I. (Susi) Holliday is a pharmaceutical statistician by day and a crime and horror fan by night. Her short stories have been published in many places and she was shortlisted for the inaugural CWA Margery Allingham prize with her story ‘Home from Home’, which was published in Ellery Queen Mystery Magazine in spring 2017. She is the bestselling author of the creepy and claustrophobic Banktoun trilogy (Black Wood, Willow Walk and The Damselfly) featuring the much-loved Sergeant Davie Gray, and has dabbled in festive crime with the critically acclaimed The Deaths of December. Her latest psychological thriller is modern gothic with more than a hint of the supernatural, which she loved writing due to her fascination and fear of ghosts. She is proud to be one of The Slice Girls has been described by David Mark as ‘Dark as a smoker’s lung.’ She divides her time between Edinburgh and London and you will find her at crime-fiction events in the UK and abroad. Married couple Jack and Ali Gardiner move to a self-sufficient commune in the English Fens, desperate for fresh start. The local village is known for the witches who once resided there and Rosalind House, where the commune has been established, is a former psychiatric home, with a disturbing history. At first it appears as if Ali and Jack are just seeking a place to find some peace. A secluded old hospital with a suspicious reputation, now run by a small cult-like group, sounds like just the right place to do exactly that. Bit by bit the reader learns that Ali and John have their own secrets to protect, and that a secluded isolated house fits into their plans to keep certain aspects of their lives hidden. Instead of connecting with the others Ali is stand-offish and behaves as if Jack is a ticking time-bomb only she can control. Angela tries to connect with her, perhaps more so out of morbid curiosity and with her own slightly stalkerish and creepy research in mind. Ali’s odd behaviour makes Angela take a closer look at the strange couple, which sets off a tragic sequence of events. 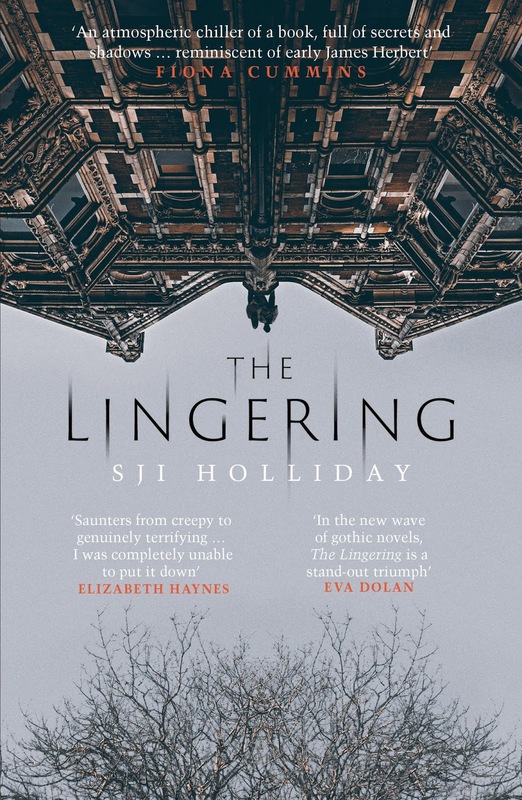 Holliday combines layers of paranoia, fear and suspicion from the past and the present to create an unstable environment, which keeps the reader on their feet. Are we dealing with unhappy souls walking the halls looking for a semblance of revenge or is the cold calculating ruthlessness of a possible killer skewing the aura of the so-called peaceful commune environment? This is an intriguing mixture of crime and the paranormal. It has a gothic vibe, and yet simultaneously it has the feel of a pulsing modern crime story, both elements feed on each other to create a captivating read. Buy The Lingering at Amazon Uk or go to Goodreads for any other retailer. 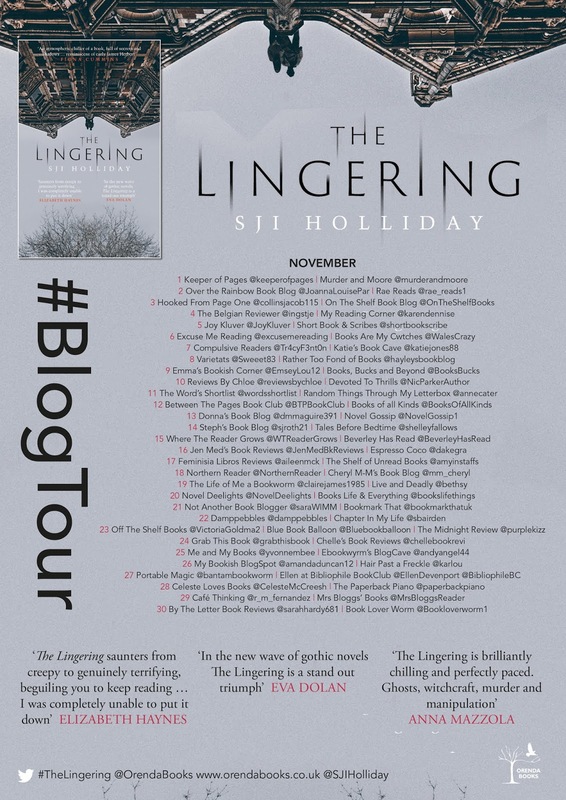 This entry was posted in Blog-Tour, Crime, Gothic, Random Things Tours and tagged #RandomThingsTours, Blogtour, crime, Gothic, Orenda Books, SJI Holliday, The Lingering. Cherylmmbookblog by CherylM-M is licensed under a Creative Commons Attribution 3.0 Unported License.